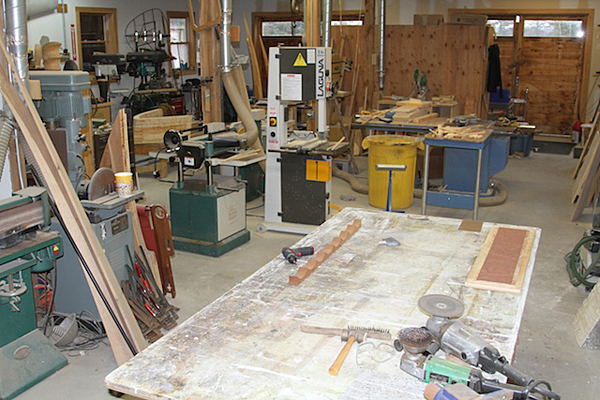 I am fortunate to have a big, sprawling studio of multiple rooms and spaces jammed with materials and hand tools and machines — cheek by jowl. In order to function and not go insane, I need this one, bare table surface that I force myself to clear regularly. Of the dozen “surfaces” in my studio, most are covered and end up being repositories for detritus of some sort or other. My particular favorite is my 4 x 8-foot rolling table. I can really spread out on this, have elbow room, and cut and shape and create the mayhem that ends up being my work. I unfortunately learned this late in life: The thing about scraps and cut-offs is, if I’m not going to use it in the next six months, out it goes. Otherwise I would end up being like the Collyer Brothers! My husband and I have each been blowing glass for 20 years. In 2007 we moved to a saltbox barn on the shores of the Eastern River in Dresden, Maine. We decided it would be best to “house” our individual studios under one roof and one name, and Tandem suited the way we work together to realize our individual designs. 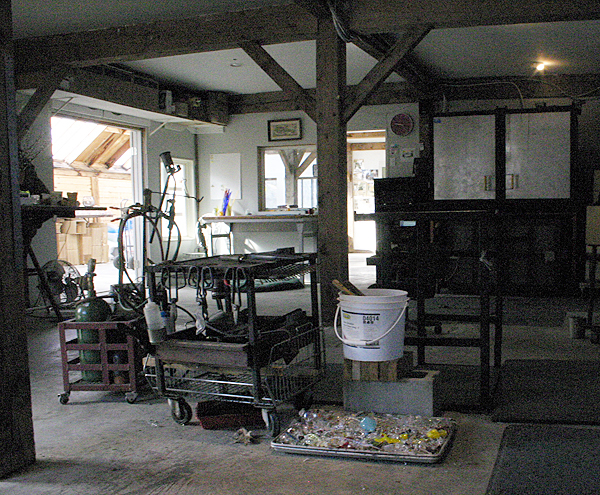 In addition to blowing glass, we carve glass using a lathe and etching materials. We both work in several directions simultaneously, and our designs make their way from our studio to our showroom and then out into shops and galleries. 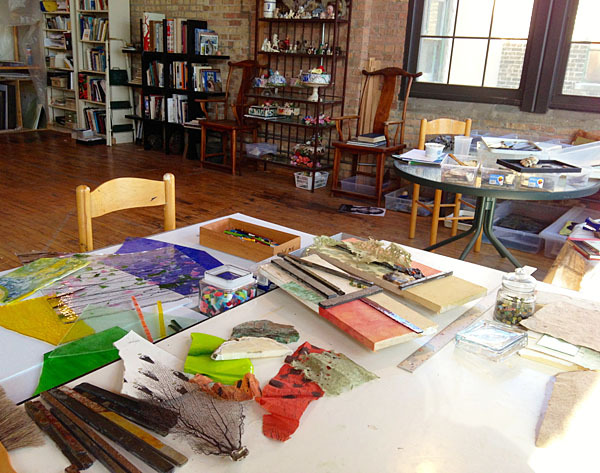 My winter studio in Chicago is 1,400 square feet, which gives me the ability to juggle several projects at once. I can work on large canvases in one corner and mosaic projects in another. In between I’ve set up a collage station, where drawings, discarded palettes, and sheets of paint peeled from old paintings are torn apart and recycled. Studio scraps, objects from the trash, slate, seeds, glass, and coral – all are fodder for this new work. I’m obsessed at the moment with the balance of nature, and how opposing forces coexist throughout life. Cause and effect, order and chaos, good and evil – paradigms that shape how we live. The compositions juxtapose manmade materials with items from nature. My intent is to balance a fluid dynamic of natural elements within a formal composition. What’s really fun is giving old drawings and other items from my past a new life by incorporating them into these pieces.